Editor’s note: The following guest post was written by contributor Ashkan Karbasfrooshan, founder and CEO of WatchMojo. Forrester Research projects $7.1 billion for 2012 but couldn’t give me an estimate for 2011.
video advertising around video and text content. 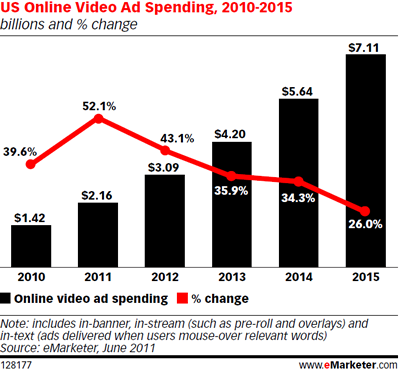 In 2007, I published a post that aggregated a series of projections for where online video advertising would be in the future. One estimate, set in 2004, of the expected size of the US online video ad market by 2009 was $657 million. A year later, there was a 2009 estimate at $1.5 billion. According to the IAB, the actual number for video advertising in 2009 was $908 million (and grew to $1.4 billion in 2010). If you go back to 2007, estimates for 2011 ranged from $4.3 billion (eMarketer, again) to $10 billion. The economic meltdown of 2008-09 made all previous projections moot, but its net effect was favorable for online advertising and video at the expense of print and television advertising. Despite that, eMarketer’s current $2.16 billion forecast for 2011 is half of what it projected four years ago. A cynic would argue that VCs essentially underwrite this “research” to pump portfolio company valuations, sending everyone into a frenzy. That’s not totally unfair, but it’s not true either. Without a doubt, online video is a mainstream activity and part of the ecosystem: “With comScore estimating that 100 million people will be watching a billion pieces of video content per day, there’s no denying that there’s more of an opportunity than ever before for advertisers to take advantage of video,” says Digital Broadcasting Group Chief Product Officer Matthew Corbin, who was previously at YouTube and Tremor Video. But I’ve closely followed investor expectations and analyst forecasts and, personally, I think online video has not met expectations, let alone surpassed them. The low-hanging argument is “a lack of definitions”. That’s BS. It doesn’t really matter if “video advertising” includes an in-banner video ad around an article or a video pre-roll before a video. In the end, online video should be everything that has one video component. While online video has exploded, no one could have foreseen YouTube’s ever-growing grip on true video views. I’ve argued that YouTube strategically sat on revenue early on, only once their dominance was secure did they start to implement the things that would make more money for producers, finally adding the one game-changer recently—audience tracking and analytics. User-generated content remains one of the more popular categories of content. With distribution companies “curating” UGC and many marketers not willing to pay the premium rates that premium commands, we are seeing more monetization around UGC than ever before. Combined with limitless inventory, this pulls down the total ad revenue growth rate—make no mistake about it. Instead of paying premium rates advertisers get away with paying less to reach users by being able to run ads next to cheaper UGC content. And not all the UGC inventory sells out. There’s plenty of unsold inventory so marketers drive prices down. While the definition of what is “online video advertising” isn’t really an issue, the lack of transparency is, especially when it comes to differentiating between in-banner and in-stream inventory, disclosing it, and pricing it accordingly. If advertisers are conditioned to pay for in-stream but get in-banner, this distorts reality and expectations. My one-year old daughter stands in front of the television and presses her hands against the screen. But guess what? My three-year old doesn’t. Neither does my wife or I. Just because the click-through rate (CTR) was an acceptable (questionable) metric for display banners and search results, why on earth should it be for video? How many normal, average viewers even know that you can click on a video? Video is for branding, and branding works with or without clicks, but when ad buys are “optimized” based on CTRs, then naturally you will be taking two steps forward and one step back. Like it or not, the main tool in the video marketer’s toolbox remains the pre-roll. Taking a 30-second television spot and adapting it for online is simple. Thankfully we’re seeing 15-second ads become the norm. With YouTube owning such a large share of views (over 40% according to comScore) and only recently embracing pre-rolls, no wonder video advertising failed to meet previously-set expectations. According to Accustream, digital video media spend spiked 89% in 2010 with the addition of YouTube pre-roll inventory. Marketers will only spend more money online when they see the kind of content that compels them to do so. With NBC, Disney and FOX retreating from free, ad-supported distribution, expect advertisers to need more convincing before opening up. US advertising on Mobile will top $1 billion for the first time, most of that comes from display and search ads. Naturally mobile can be a strong driver for video content but not necessarily video pre-rolls. Until the iPhone burst open the mobile market, carriers were suffocating mobile video. “We’ve made progress. Demand and inventory are growing and standards like VAST and VPAID have eased the effort. But buying digital video and understanding what you bought is still too hard. ” states TubeMogul’s Brett Wilson. Google’s perfect storm in search won’t be repeated in video: there won’t be one clear winner in video, and those who survive will only be considered successful relative to the investment they required to thrive. Will online video advertising top $5 billion in 2014? Do I hear $10 billion? Until the online video industry gets its act together, these forecasts will turn out to be just as wrong as their predecessors.